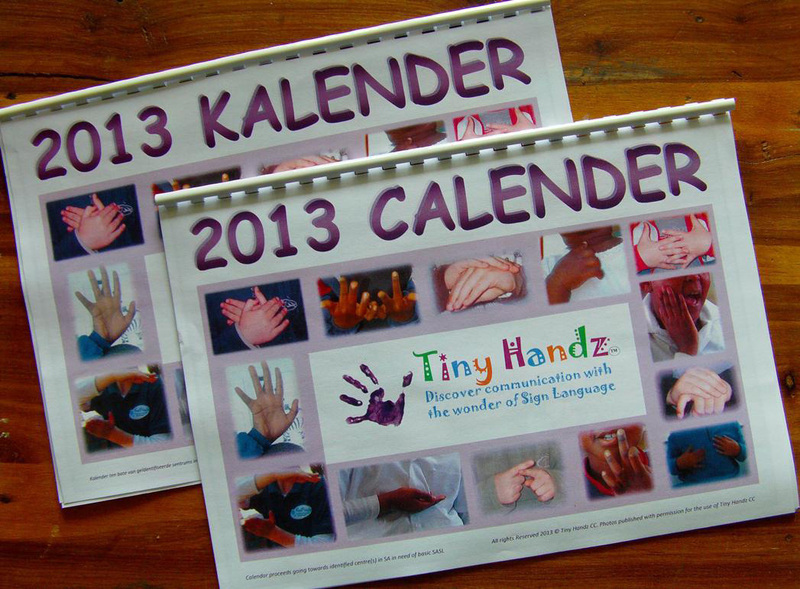 We are so excited to finally show you our Tiny Handz Calendar for 2013. SOO many stories have warmed our heart over the last 4 years that we have been waiting for the right time to do this. Now the time has come and we hope to do this annually! This calendar consist of various photos of our children and even special needs adults across SA using SASL for their daily communication needs (featuring Unica school, Lettie Fouche School, Thuthukani, Carpe Diem, Footprints, Hi Hopes, Aanhouwen Centre, Loren Stow Parent Support group and more individual cases as sent by therapists and teachers). We have two options for you: the plain white paper A4 calendar and then the laminated A4 Calendar which can be used to write on as well with a non-permanent pen for possible notes. All calendars ringbinded for your convenience. Both Afrikaans and English Calenders are available. 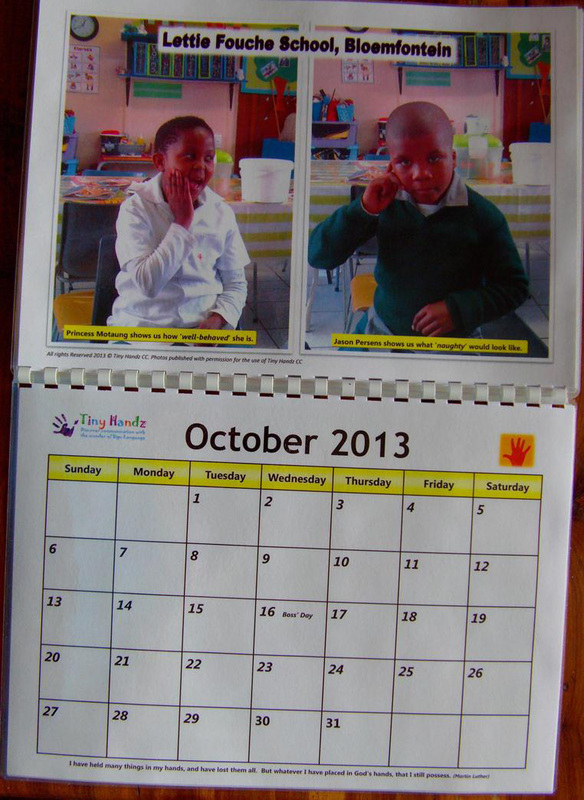 Profit made from the calendar goes towards subsidising centres that have already identified their need for this training but cannot afford it, for 2013. SO please do support us in buying the Calendar and you will be supporting them as well! Also, consider our other products for sale, especially put together for all our clients! Our material is unique in that you will not find any similar product in SA. We hope to bring out even more early next year, especially in the form of storybooks and even DVD’s with stories and rhymes, later next year. Thanks so much for your support and being part of the Tiny Handz Family and to everyone that made a contribution! Please join us on Facebook (www.facebook.com/groups/118997840383/) or go to our website (www.tinyhandz.co.za) and click on the Facebook link at the bottom of the Home page. Thank you so much for your support and keep on changing your world! For more info on Tiny Handz and the training we do for the special need environments as well as a list of those who have undergone our training since 2009. Please see the registration form that needs to be completed and send back to us for the date you wish to join us. You can fill this in electronically and e-mail it back to us, or fill it in by hand and fax it to the number on the form. Once we received your registration form, we send you the final info (address of the venue, etc). Please note that your payment should only be made after sending your registration form, which upon you will receive a confirmation e-mail. Payment can be done over two months if arranged beforehand. Also note that the training is not limited to professionals but to anyone within the special need spectrum i.e. parents, caregivers, teachers, interested family members, etc. 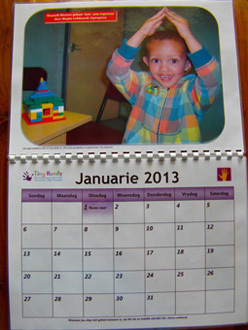 If you wish to see your full SA training schedule please visit our website www.tinyhandz.co.za/classes.html and click on the pdf link, or click here (schedule for February - May 2013). Tiny Handz is excited to also host specialized training of specific signs for use within the hospital / rehabilitation environment focusing even more on adult individuals in the hospital or rehabilitation environment who have lost speech due to stroke, operations, recovering in ICU and various other medical conditions etc. for use of these signs to help with communication (even if just for a period of time). This is an optional 2 to 4 day training with 7 to 17 CPD points to be allocated, depending on the length of the training required, open to all within the medical and health environment. Those interested can contact us directly for more information on this training as well as a specific programme layout. Excited to possibly meeting with you soon! The workshop was really great and as a special school, we will really need and use this! Grey Hospital.